A Medical Intuitive is a person with natural intuitive abilities and a specific talent for identifying energetic imbalances in the body. By using a developed ability to look into the body and evaluate its health or problems Martine energetically scans a body for many different ailments including (but not limited to) dis-eases, genetic deficiencies, food or environmental allergies, supplements and anomalies. Although Martine works extensively with the medical community she is solely a Medical Intuitive: she is NOT trained in medicine and is NOT a medical professional. One should always consult with a physician before making any changes in diet, exercise, and/or changes in medication and supplements. How do I know a Medical Intuitive is good for me? Always, always use your gut instinct or intuition. If it does not sound or feel right, it is not. You are always the judge. It is Your body and Your life! Try to find someone you feel very comfortable with who can tell you things that make sense and put you on the right path. Always follow your own common sense and TRUST that you know your body better than anyone else. Be your own best advocate. A medical intuitive should GUIDE you only. What is a healer? What is Energy Healing or Energy Medicine? A healer, in short, is someone who is gifted and called to facilitate healing in others. Energy Healing (also called Energy Medicine) has been around for millennia and is one of the most ancient healing techniques you can use to keep your body in a balanced and healthy state. Martine practices a combination of a dozen techniques which she has learnt primarily in Asia but also in Europe and the US. The moment you connect with her, the energy will flow to you and it stays on during the entire consult and even after. It all depends upon your body and need: it is an automatic adjusting of the energies in your body which might be deplete or off. Clients feel immediately lighter and healthier. The protocol Martine suggests will, over the months following the consult, multiply that feeling of wellbeing and health. What does ‘scanning’ of the body mean? Energetic deficiencies are seen even before physical deficiencies appear. Martine has the ability to check the overall energetic health and deficiency of the body and 'scans' system by system, organ by organ. A deficiency percentage is attributed to each system and/or organ which then in turn is linked up with each other. The ultimate goal is to get to the original culprit or cause. Once that is found, a personal and quite individualized protocol is made. What does ‘energetic deficiency’ mean? An energetic imbalance or a deficiency is when an organ or system is not in balance and shows energetic or even physical problems resulting in disorders or diseases. During a private session, Martine checks the body of a client, and determines where the imbalances are, how far they have progressed and in how far they have translated in physical problems. She then 'scans' for possible solutions which line up with the energy and the dis-ease of the client. When clients are in the ‘energetic deficiency’ stage a lot can be done for the imbalance to stop progressing into physical complaints or disease. Martine does not have any formal medical or psychological training but is often called in when medical professionals are stumped or people have struggled to get diagnosed and find the right therapy for years. She has a very developed intuitive or psychic ability to look into the body and evaluate its health or problems. She is known worldwide as an incredible source of specific 'health' information and has helped thousands of clients find a way out of years of dis-ease in easy, cost-effective and durable ways. Besides being extra-ordinary gifted, she did also excel in her vast studies. She amassed the knowledge and actual practice of tens of ancient and modern systems with masters in China, Taiwan, Indonesia, India, Australia, Europe and the US. What do clients say about Martine? Martine has helped thousands of clients worldwide over the last decades. To read a selection of their individual experiences with her click on testimonials. How correct are Martine’s answers? We all have an error margin of 50% when we need to decide on a yes or no answer. Doctors are known to score an average of about 80% ; Martine about 95%. There is always a degree of error, either way. Please remember that Martine's consult are for information purposes only and that one should always consult a health professional to talk about one's health. Is there anything I can’t use Medical Intuition or Healing for? No. Since all is energy… Medical Intuition and Healing is useful for all dis-eases and imbalances. How do I buy Martine’s books? 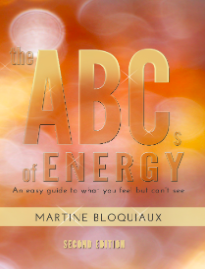 The ABCs of Energy, Martine explains in simple, easily understood ways the workings of all types of energies—from the physical and emotional all the way to the spiritual. It is now also available in PDF format. The Energy of a Healthy Body looks at the energies in a body and how we can become more healthy and happy beings. It is filled with health messages and coding so that just by reading one connects to the beautiful and healing energies Martine emits. The book is now also available in PDF format. How do I contact Martine regarding the promotion of her book? Is Martine open to a speaking engagement regarding her book? Are there any limitations on confidentiality during Martine’s sessions? Martine offers fully confidential services and follows all HIPAA (Health Insurance Portability and Accountability Act of 1996) Privacy and Security guidelines, as established by the US Department of Health & Human Services. How do I pronounce Martine’s last name?